It's true... in case you haven't noticed yet from many of my recipes, I love all things coconut! It's a very nutrient-dense, power house food! I use coconut oil almost daily, coconut flour occasionally, we make coconut yogurt, the flakes can go on or in just about everything (salads, treats, make your own coconut milk, etc.) and I use coconut milk for all sorts of green smoothies, cooking, and even "ice cream!" It's funny to see myself write that because I used to hate coconut. Little did I know that unsweetened coconut was absolutely amazing! It's those commonly used sweetened coconut flakes that I really can't stomach. I've been really excited to try this recipe because over the Christmas holiday, I actually was one of the winners of a giveaway on Facebook (thanks Paleo (f)x!) 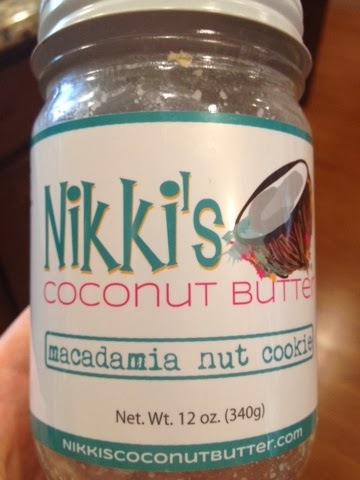 and chose Nikki's Coconut Butter. The company sent me any two jars/flavors that I wanted and I chose Pumpkin Spiced Donut (a seasonal flavor) and the Macadamia Nut Cookie, which waks definitely our favorite! Once the jar was finished, I was determined to try to make my own since it costs $13 a jar and another $5 to ship it from their site (or $15 with Amazon Prime). I figured I could easily make the same amount (a pint) for $5 or less. As a brief background, I actually made coconut butter once before. I saw a post about it on Mark's Daily Apple and decided to try it. I made it and then it basically sat in a Tupperware in my cupboard for a few months. This is probably because I really didn't know what to do with it. One day I finally threw it in a stir fry because I didn't want it taking up space anymore. 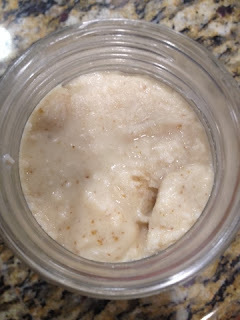 Coconut butter can be used in place of coconut oil in most cooking. 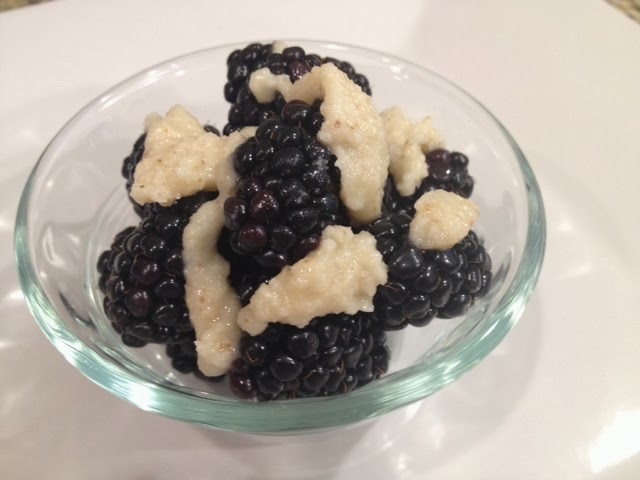 My favorite way to eat the macadamia coconut butter is with apple slices or drizzled over fresh berries as a "dessert"... Delish! I think I will try spreading some of it on our gluten-free waffles next time we make them! If you have a nut allergy or want to try another kind of coconut butter, all of the ingredients besides the coconut flakes are optional. If you want it plain, just throw the coconut in the food processor and that's all it takes. You could also throw in a teaspoon or two of honey/pure maple syrup and some cinnamon or whatever fits your fancy :) Just so you know, coconut butter is a little gritty so if yours turns out that way, it's perfect normal! I am really pleased with how it turned out! I may let it go a little longer in the food processor next time so it gets a little bit runnier. Depending on the temperature of where you store it, if it is a little hard when you want to eat it, simply put the entire jar in the microwave for 20-30 seconds and it will make it nice and soft and spreadable! If you'd like to check out the recipe I referenced to come up with my own, here it is. Hope you love it! 1. In a large skillet over medium heat, toast the macadamia nuts until lightly golden and fragrant (about 5 minutes). 2. In a food processor, combine all ingredients. Process the mixture, stopping occasionally to scrape down the sides, for about ten minutes or until the mixture is blended and as smooth as possible. 3. Transfer to an air-tight, glass container (a pint-sized mason jar is perfect for this). 4. Let the mixture cool to room temperature (the food processor warms the butter), screw on a lid and store at room temperature. What snacks have you prepared so far this week?